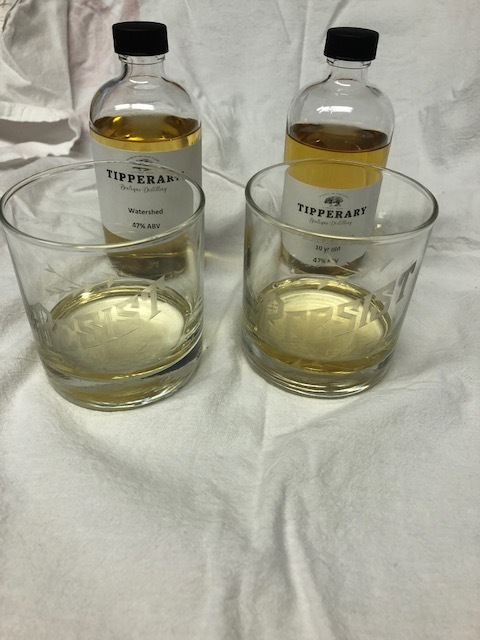 Recently, I received samples of two single malt Irish Whiskeys from the Tipperary Boutique Distillery in County Tipperary, Ireland. The distillery has only been operating since March of 2016, but already has some very high quality whiskey on the market. I foresee them doing great things under the management of co-owner Jennifer Nickerson. She is passionate about whiskey, especially sharing it with other women. Obviously, we are very on board with that! Watershed is aged in six first-fill bourbon casks that are carefully chosen for each batch. It is cut to 47% ABV with Ballindoney fresh water that flows down into the watershed (get it?) around the distillery from the mountains that surround it. This whiskey has a fairly sweet nose that was plummy with hints of raisins. The flavor starts off with some caramel notes and peppery spice on the front that subsides to a rich, buttery finish. It is a very easy sipper, and I can absolutely see why Watershed won double gold at the 2017 San Francisco World Spirits Competition! Watershed is delicious paired with cheese and chocolate, as the cheese brings out the buttery finish, and chocolate highlights the sweeter caramel notes on the front of the tongue. Knockmealdowns is a 10 year single malt that is also matured in just six ex-bourbon casks and again cut with that fresh Ballindoney water to 47% ABV. It’s named after one of the mountain ranges surrounding the distillery from which that water flows. Knockmealdowns has subtle oaky barrel char and mustiness on the nose, almost peaty. The flavor starts off with a bit of leather and more smoothness/less spice than The Watershed. It rounds out to a pleasant mustiness that I kept describing as my grandma’s basement! To be clear, this is a very good thing. I found Knockmealdowns to be best sipped neat so that I could experience all the nuances this whiskey has in its flavor profile. Both Watershed and Knockmealdowns are available from Wine Globe, and they are moving onto the menus at more high end cocktail bars like The Whiskey House in San Diego. Cheers to Tipperary and more women owned distilleries!